In the midst of the Great Depression, America's railroads turned to fast trains to draw the public back to rail travel. The very first streamlined train to hit the market was the Union Pacific M10000, a three-car articulated train. Introduced in February 1934, it was powered by a gasoline engine and was built by Pullman-Standard. A wooden scale model had been wind-tunnel tested for optimum aerodynamics. The M10000 had a yellow and brown color scheme and was air-conditioned. One month later, the Burlington Zephyr appeared. It was bright stainless steel and was built by Budd in Philadelphia. In fact, the public introduction was made on Pennsylvania Railroad tracks - at North Philadelphia Station. The Zephyr was a diesel-electric powered train, just like most of today's trains. 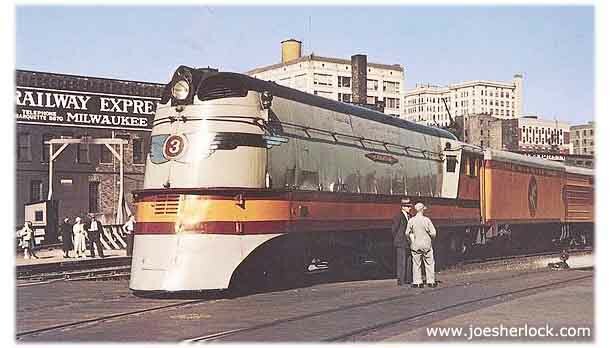 The first streamlined steam locomotive was the Milwaukee Road's Hiawatha introduced in 1935. The train was designed by Otto Kuhler, a noted industrial designer, artist and painter. The Hiawatha name was from a character - described as "swift of foot" - in the epic Henry Wadsworth Longfellow poem. The Hiawatha steam locomotive and tender were built by Alco (American Locomotive Co.). The engine had an Atlantic wheel arrangement (4-4-2). The railroad's Milwaukee shops produced 50 matching passenger cars. With the bold slogan 'Nothing Faster on Rails', the Milwaukee Road inaugurated its Chicago-Twin Cities Hiawatha passenger service in May 1935. The original, oil-fired Hiawatha was the fastest scheduled steam train in the world, averaging 85 mph with stops. The stylish, colorful Hiawatha was a smash hit, hauling 1 million people in 40 months and spawning larger steamers (and later diesels) to haul a series of distinctive orange and crimson passenger cars. The new Hiawathas offered luxurious accommodations, including the Tip Top Tap Room - the first stand-up cocktail bar on American rails. Later Hiawatha steam locos were based on a 4-6-4 Hudson-type wheel arrangement for greater pulling power and were coal-fired. As the new streamlined look caught on, many other sleek steam, diesel and electric trains were built - in the U.S. and overseas. The Mallard, a very swoopy British L.N.E.R. (London & North Eastern Railway) 4-6-2 Pacific-type engine, still holds the world's speed record for steam-powered trains - 126 mph set in 1938. 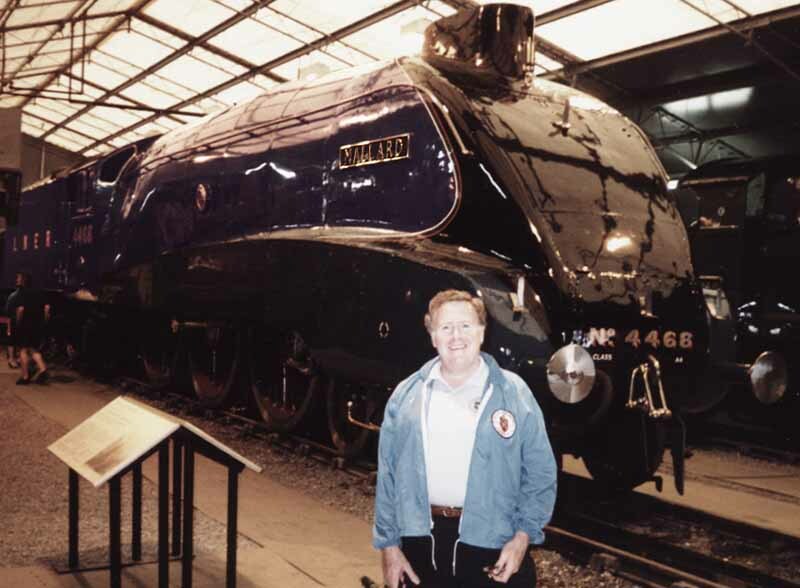 The Mallard continued in regular service until 1953 and is now on display at the National Railway Museum in York, England. It is a very cool looking engine - in a bright blue paint with a shiny black wedge nose, set off with red striping. 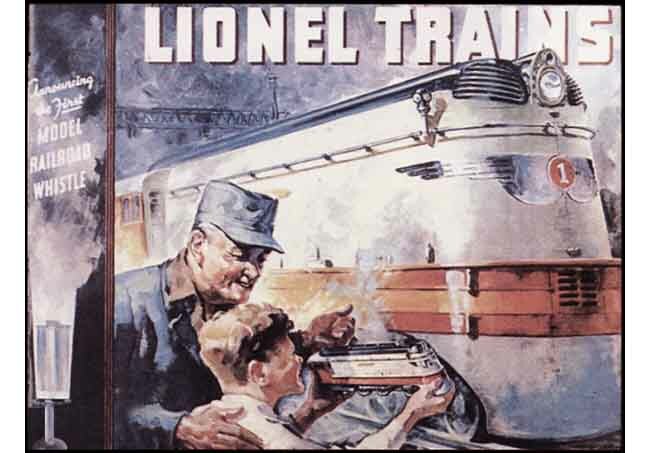 During the Depression, toymaker Lionel offered models of some legendary streamlined trains in an attempt to build sales and exit from receivership. Lionel first introduced an O-gauge version of the Union Pacific M10000 in the summer of 1934 - almost simultaneous with the debut of the real train. In 1935, Lionel's model of the Hiawatha was introduced at a retail price of $32.50. 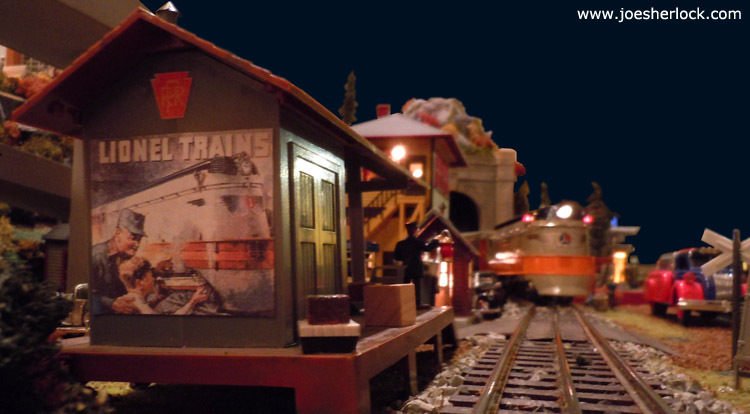 The set included a diecast locomotive, a stamped tinplate tender and a string of three tinplate passenger cars. 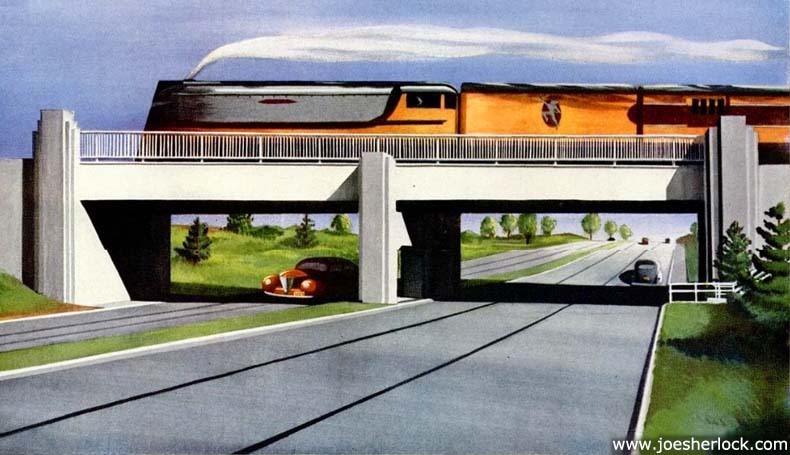 The cars were the same as those on the M-10000 but were painted in Milwaukee Road colors. The Hiawatha was Lionel's first locomotive to feature a realistic whistle. While the sound produced may seem anemic compared with today's digital offerings, it was considered a technological wonder back in '35 and was vigorously promoted by Lionel. Produced between 1935 and 1942, the Hiawatha was later reissued by Lionel in 1988, using the original tooling and molds. Buoyed by the success of its M-10000 and Hiawatha trains, Lionel expanded its streamliner offerings over the years. In 1947, my dad gave me a wonderful Christmas present - a huge three-level Lionel train layout. For me, the most memorable train on that layout was a colorful, prewar Lionel Hiawatha passenger set. When I decided to build an O-gauge layout in 2000, my first acquisition was the 1988 reissue of the 1935 Lionel classic streamliner. I replaced the 1935-era whistle with a QSI sound and train control system, which included a realistic digital whistle, steam loco chugging and puffing sounds and a 'station stop' sequence with announcements. PRR MP54 - These MU coaches served commuters for over 50 years.